For a Few Dollars More (Italian: Per qualche dollaro in più) is a 1965 Italian spaghetti western film directed by Sergio Leone and starring Clint Eastwood, Lee Van Cleef, and Gian Maria Volonté. German actor Klaus Kinski also plays a supporting role as a secondary villain. 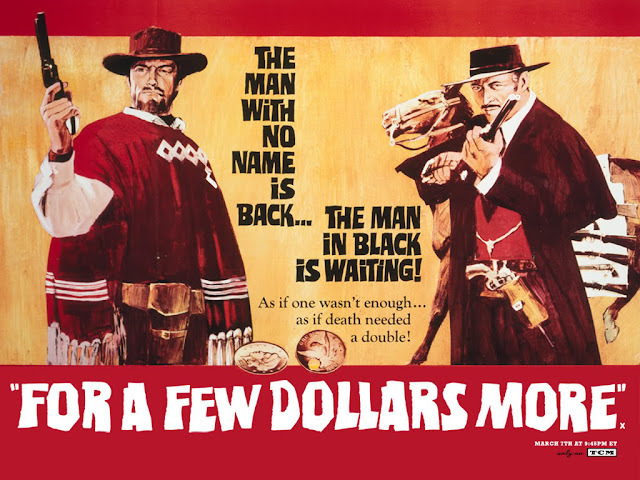 The film was released in the United States in 1967 and is the second part of what is commonly known as the Dollars Trilogy, following A Fistful of Dollars and preceding The Good, the Bad and the Ugly. The Man with No Name—"Manco"— and Colonel Douglas Mortimer—the "Man in Black"—are two bounty hunters in pursuit of "El Indio," one of the most wanted fugitives in the Wild West, and his gang. El Indio is ruthless, clever, and brutal. He has a musical pocketwatch that he plays before engaging in gun duels: "When the chimes finish, begin," he says. Flashbacks reveal that El Indio took the watch from a young woman whom El Indio found with her lover (in Joe Millard's novelization of the film, her newly-wed husband), killed him, and raped her; she killed herself while being raped. There is a photograph of the woman inside the cover of the watch; it was a gift from her lover (in the novelization, it was a wedding gift from her brother). Mortimer illegally stops a train in Tucumcari and kills Guy Calloway, displaying both his arsenal of weapons and his gunslinging skill as he easily kills Calloway at long range while the outlaw is shooting at him. After collecting a bounty of $1,000, Mortimer inquires about Red "Baby" Cavanagh, who has a $2,000 bounty on him and was last seen in White Rocks. He learns that Cavanagh has already been targeted by "Manco" ("one-armed" in Spanish — see below for an explanation). Manco rides into White Rocks and finds Cavanagh in a saloon playing five-card draw poker. Manco kills him and his men and collects the bounty. El Indio's gang, led by his right-hand man Nino, break into the prison where he's being held and free him, killing the warden and most of the guards. El Indio's next target is the Bank of El Paso and its disguised safe containing "almost a million dollars." The two bounty hunters arrive separately in El Paso, learn about each other and, after butting heads, decide to team up to take down El Indio and his gang. Mortimer persuades a reluctant Manco to join El Indio's gang for the robbery in order to "get him between two fires." Manco breaks one of Indio's friends out of prison and is admitted to the gang. El Indio's plan includes Manco and some of El Indio's gang providing a distraction by robbing another bank in another town, but Manco guns down the gang members and sends a false telegraphic alarm. Once the El Paso sheriff and his posse leave town, El Indio and the rest of his gang invade the bank and carry off the safe, which they can't open. They ride to the small border town of Agua Caliente, where Mortimer is waiting. One of El Indio's men, the hunchback Wild, recognizes Mortimer from a previous encounter in which Mortimer had deliberately insulted him. He forces a showdown and Mortimer kills him. Mortimer then proves his worth to El Indio by cracking open the safe without using explosives. El Indio then says he will wait a month before dividing the loot to allow the furor over the bank robbery to die down and locks the money away. Manco and Mortimer attempt to steal the bank money from El Indio, but are caught in the act. El Indio's men severely beat them and tie them up. Later, Nino, on orders from El Indio, kills their guard and releases them. El Indio informs his gang that Manco and Mortimer "got away", and sends the gang in pursuit, intending let his gang and Manco and Mortimer kill each other off while he and Nino take all the loot for themselves. However, Groggy, one of the more intelligent members of the gang, figures out what El Indio is up to and kills Nino. Before he can kill El Indio, he finds that Mortimer has already removed the stolen money from where El Indio had hidden it. El Indio convinces Groggy to join forces with him to trap Manco and Mortimer. The next morning, El Indio's men confront Manco and Mortimer in the streets of Agua Caliente. Manco and Mortimer kill the gang, one by one, in a running gun battle. Standing alone, Mortimer shoots Groggy as he runs for cover, but then has his gun shot out of his hand by El Indio. El Indio then takes out his pocket watch and starts it playing. As the music nears the end, Manco suddenly appears with an identical pocket watch, which plays the same tune as El Indio's and which Mortimer realizes had been taken from him earlier. Manco covers El Indio with a rifle (an 1854 Jennings Rifle Company Volcanic Rifle) and forces El Indio to wait while he gives his own gunbelt and pistol to Mortimer, evening the odds. "Now we start," Manco announces and sits down while Mortimer and El Indio face off, with the watch playing again. During the standoff, Manco looks in Mortimer's pocketwatch and sees the same photo as in El Indio's watch. The music finishes, and Mortimer outdraws and guns down El Indio. Mortimer takes El Indio's pocket-watch. Manco gives him back the other watch and remarks on a family resemblance to the photo. "Naturally, between brother and sister," Mortimer answers. His revenge complete, Mortimer declines his share of the bounties and rides away. Manco tosses the bodies of El Indio and his men into a wagon, adding up the bounties, and finds he is short of the $27,000 total. He spins around to gun down Groggy, who had survived and was sneaking up behind him. As he leaves, he recovers the money stolen from the Bank of El Paso, though it is not clear whether he intends to return it. He then rides off into the distance with two horses towing the wagon. Link error tida ada filenya.